12 months - $88.99 Only 2 left! 18 months - $88.99 Only 8 left! 2T - $88.99 Only 7 left! Did you know that the song “Run Rudolph Run”, popularized by Chuck Berry, was written by Johnny Marks, who also wrote "Rudolph the Red-Nosed Reindeer”? And did you know that it was Marks’ song that prompted the making of the Rudolph the Red-Nosed Reindeer Christmas Special (shown on TV every year since 1965)? His brother-in-law, a copywriter, wrote the original story for a Montgomery Ward promotional booklet, and Marks turned the story into a song. Marks’ neighbor was Arthur Rankin Jr, of Rankin/Bass Studios, who turned into a stop-animation Christmas special, and the rest is (literally) holiday history! Marks also went on to write "Rockin' Around the Christmas Tree" and "A Holly Jolly Christmas.” Boy, that guy sure must have loved Christmas! And now, when you dress your baby up in our favorite holiday animal, everyone else will, too! Even if your baby can’t run yet - cause they’re a baby! - you’re still gonna love how much they’ll look like a sweet little baby reindeer in this Baby Reindeer Costume! Made of 100% polyester, this adorable jumpsuit zips in the back and has snap buttons along the leg inseams for easy changing. There’s also an attached reindeer tail in the back for extra cuteness, and the headpiece sports a black nose and black antlers. Booties also have anti-slip grips on the bottoms, just in case your little reindeers feels like taking off in the icy snow! 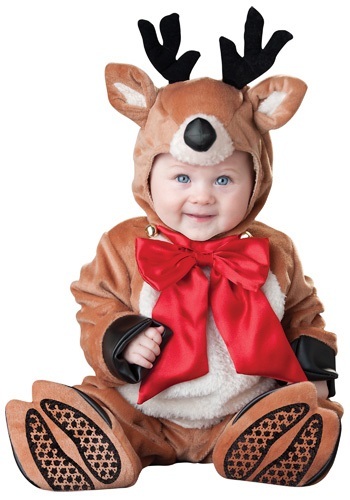 In this Baby Reindeer Costume, Santa will definitely be getting all the help he needs in spreading some holly jolly cheer this holiday season!